Despite last night’s thunderstorm, the morning sun peeks over the beautiful Suances cliff lookout, just 400 metres away, and cloaks the living room in its warmth. The sound of the sea surrounds us and the views are overwhelming. Iván Gutiérrez (Suances, Cantabria, 1978) has spent many afternoons watching boats pass by, pondering their destination. Others were spent hidden from life, with Iván closing the curtains to block out the warmth of the sun and the sound of the waves, and burying himself under the sheets that serve as both a refuge and a prison. We take a seat by his side, with the sea at our backs, to talk about the depression he continues to fight to this day. The ninth stage of the 2013 Tour de France marked the beginning of the end of Iván Gutiérrez’s career. During the second stage circling the Pyrenees, the peloton took on the 168 kilometres between Saint-Girons and Bagnères-de-Bigorre up four first-category climbs: Col de Menté, Col de Peyresourde, Col de Val Louron Azet and the Hourquette d´Ancizan. The Movistar team, with Alejandro Valverde and Nairo Quintana sharing the lead, started the stage by attacking the first second-category climb, Portet-d’Aspet, with Imanol Erviti, Jonathan Castroviejo, José Joaquín Rojas and Iván himself. With ten participations, the Cantabrian was the most experienced rider on the Spanish team. In 2000 he rode within the lines of the ONCE team at the Under 23 World Championships and wore his rainbow-coloured champion jersey with pride. He was one of the greatest time trialists in Spanish cycling: four-time time trialist champion and two-time road champion in Spain. His career in sports brought him individual success and also helped him bring success to others in his work as a domestique. But that day, during the Peyresourde climb, he was overcome by the strong desire to go home. To outsiders, his life looks perfect, and that’s why he has felt misunderstood within his illness. Four years after that Tour de France, Iván is on the way to overcoming a depression so severe that it not only ended his career, but almost cost him his life. Eleven times. After his abandonment on the Tour, he started to figure out what was happening to him; this wasn’t his first time. “You have to hide it. If someone has cancer it’s newsworthy and everyone feels bad for them, but no one feels bad for someone who’s depressed, people usually just want us out of the way.” During the 2014 season, he withdrew from the Tour Down Under, Paris-Nice, Tour de Flandes, Circuit de la Sarthe, Paris-Roubaix, Amstel Gold Race, Flèche Wallone, Liège-Bastogne-Liége and ended his career in August when he abandoned in the seventh stage of the Eneco Tour, a race he won in 2007 and 2008. “I was in agony. My self-esteem was extremely low; I had no energy, chronic fatigue and apathy. You can’t race in those conditions. And no one asked me what was wrong. Everyone thought it had to do with my age.” Although he wanted to compete again in Canada in September, the team doctor, Jesús Hoyos, recommended he focus on taking care of himself. He never wore a number again. Iván remembers his cycling days with a feeling of abandonment and misunderstanding. “If someone would have listened to me, I’m sure I wouldn’t have gone through this. With just a call, a message…” Cycling is an agonising sport, and he has realized that no one ever taught him how to manage his feelings. As he moved up into higher levels of competition, he learned that people paid less attention to those things. Motivated by his interest in leadership and mental training, he decided to take an emotional intelligence class from ex-footballer Imanol Ibarrondo when he was in one of his lowest states of depression. During the weeks he was in class, Ibarrondo very quickly noticed Iván’s passion for football and put him in touch with Ángel Viadero, the coach of Racing de Santander, so the ex-cyclist could attend some of their training sessions. Iván loves football. The first time his father took him to a Racing match he was just three years old. Ever since then, he’s thought of the club’s colours as his own. Years later, he would step onto the El Sardinero field in Santander for the first time to be honoured for his professional achievements in cycling. In 2015 he started going to club practices and in 2016 he joined the technical staff. He’s done that job, for free, ever since. 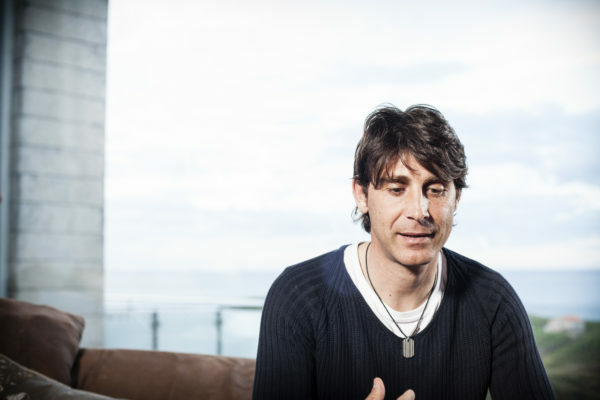 “In the beginning, the idea was for me to spend time with the players and have fun while learning good habits and bringing some order to my life.” Ibarrondo saw something in Iván and knew he could provide value to the sport; he also brought back some of the self-esteem Iván had lost over the years. “For the last four years, my work at Racing has been my best medicine,” he affirms. Some of his jobs at the club include observing player emotions, managing the team and promoting good cycling values among the younger team members. 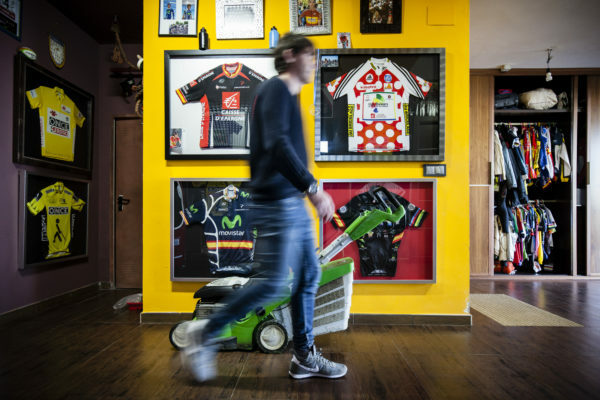 On the Movistar team (and this tends to be the same with all other cycling teams), rookie riders share a room with veterans to learn about the profession first hand. They become their mentors. “I want young people to set aside their fears and insecurities and transmit their emotions, since many of them don’t communicate well. In the peloton I was known for being an aggressive and impulsive rider. It’s true; I would have killed for my teammates. I’m sure I did it to hide my own weaknesses and I often made mistakes. I didn’t even know the riders I was up against. If I had known what I know now, I would have treated the peloton differently. I would have been much more respectful.” Iván speaks of a high-competition sport with no room for empathy, where fatigue makes you turn against yourself and where emotions such as rage, anger, euphoria, helplessness and the feeling of defeat are left for you to control. “In cycling, just as in any other sport, there are many cases of latent depression. Riders that don’t need antidepressants but do need psychological treatment, or at least someone to listen and know what they’re going through.” Iván tells us how he lived with latent depression that manifested itself in anxiety and that he could, more or less, control it while competing. But when he got off his bike at the Eneco Tour, he couldn’t take it anymore. They prescribed him antidepressants, stabilisers and tranquilisers that kept him from training. Without the responsibility of competitions on the horizon, he fell apart. He doesn’t talk about suicide attempts, but episodes. He didn’t want to kill himself, he wanted to run away, sleep, get away from the noise and get away from himself. On one occasion, the police looked for him for hours on the cliffs that are currently standing right behind him, while he sought refuge in the forest after having taken a large dose of sleeping pills. “In those moments you’re insane, you aren’t yourself; it’s as if another person takes control of your body.” He would lie to the doctors to get more medication and he’d follow his girlfriend through the house to try and find where she was hiding the pills. He now remembers how much his father cried and how bad he felt thinking of how much he made his family suffer. If it weren’t for all the times they pulled him out of bed and told him to keep going, he wouldn’t be here today.